Prime Minister, Narendra Modi being received by the Prime Minister of Japan, Shinzo Abe, during the welcome ceremony, in Tokyo, Japan on October 29, 2018. Prime Minister Narendra Modi visited Japan on 28-29 October 2018 for the 13th India-Japan Annual Summit for wide-ranging discussions on bilateral, regional and global issues of mutual interest under the framework of the India-Japan Special Strategic and Global Partnership. This was the 5th Annual Summit between PM Modi and Japanese Prime Minister Shinzo Abe and their 12th meeting since 2014. 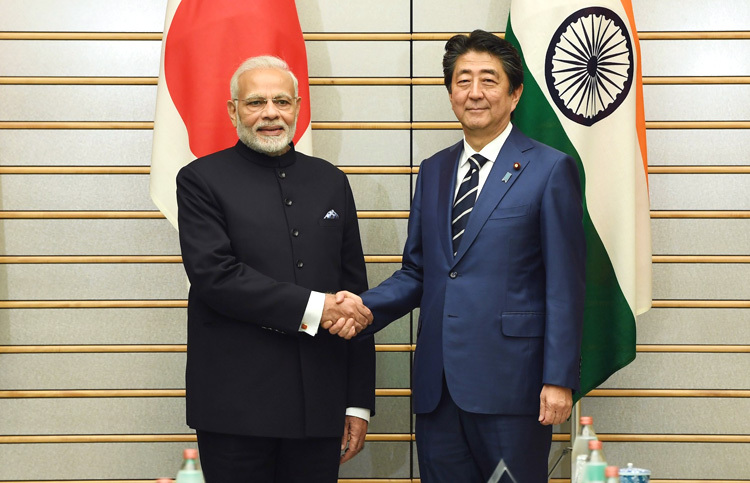 Prior to the summit, media reports indicated India is likely to get access to Japan's Djibouti military base under a proposed pact with Japan to boost defence relations including sharing military assets and capabilities and providing logistical support to each other's defence forces. US, Japan and China have military bases in Djibouti; wedged between Gulf of Aden and the Red Sea - gatekeeper to vital sea lanes of communications (SLOCS). 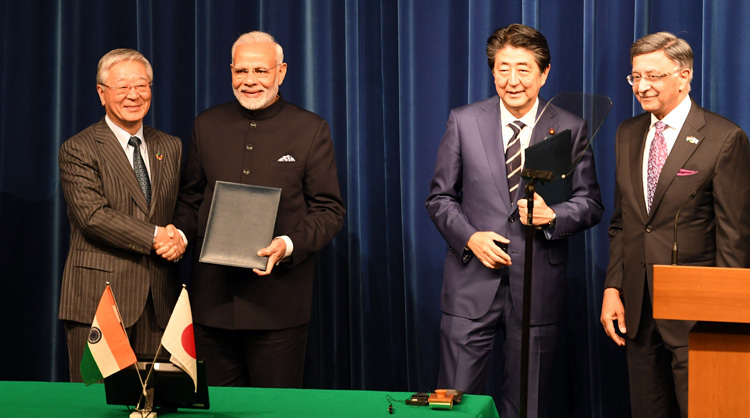 After high level delegation talks during the 13th India-Japan Annual Summit between Modi and Abe, both key agreements were signed at the India-Japan Business Leaders' Forum in Tokyo. The two nations signed six pacts, including a high-speed Mumbai-Ahmedabad railway project, third phase of the Delhi Mass Rapid Transport System Project, North East Road Network Connectivity Improvement Project, Construction of Chennai Peripheral Ring Road and naval cooperation over maritime security. 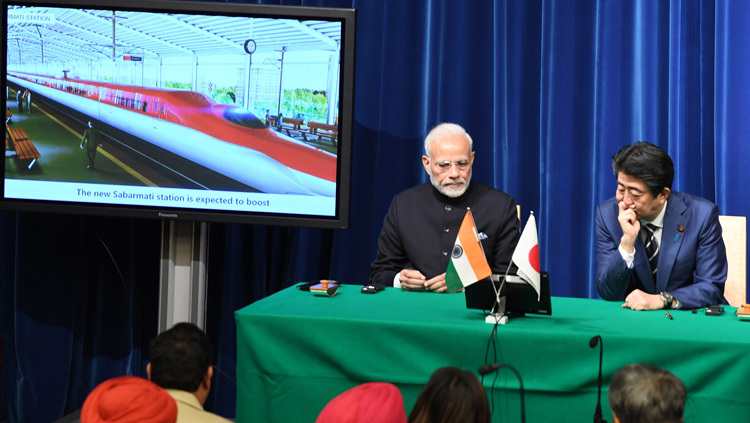 Japan is funding 80% of Mumbai-Ahmedabad bullet train project through soft loan of 79,000 crore at 0.1% interest over 50 years and a moratorium period of 15 years. Prime Minister, Narendra Modi and the Prime Minister of Japan, Shinzo Abe at the ceremony for signing and exchange of agreements, in Tokyo, Japan on October 29, 2018. The two sides also agreed to establish a 2+2 dialogue between the Foreign Ministers and the Defence Ministers of the two countries in augmenting bilateral defence ties aimed at furthering world peace and stability. The total loan provision is up to 316 billion yen. Japanese investors have announced that they will be investing 2.5 billion US dollars in India. 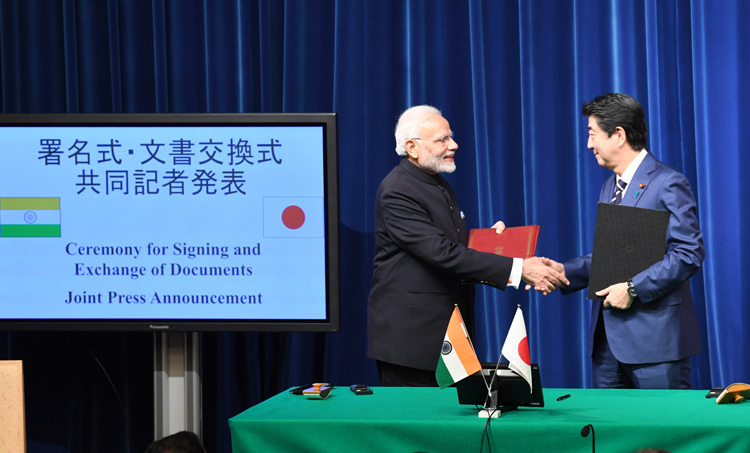 The two key announcements on defence and development projects included Japan formally joining the International Solar Alliance-ISA after the ratification of its Framework Agreement. Highlights of the India-Japan Vision Statement include: work together for rules-based inclusive world order by enhancing communication and connectivity to ensure rule of law, unimpeded trade and flow of people, technology and ideas for shared prosperity; commitment to work towards free and open Indo-Pacific, peaceful resolution of disputes in accordance with international law and UNCLOS; willingness to expand cooperation with US and other partners; review collaborative projects in Sri Lanka, Myanmar, Bangladesh and Africa – discussion for establishing "Platform for Japan-India Business Cooperation in Asia-Africa Region�; Japan to continue ODA support to India's efforts for social and industrial development; concurrence for bilateral Patent Prosecution Highway program on a pilot basis; agreement to conclude Bilateral Swap Arrangement (BSA) of USD 75 billion; launch of India-Japan Digital Partnership to develop IoT and AI solutions for societal benefits and explore new technologies; linking of Japan's Asia Health and Well being Initiative (AHWIN) with India's Ayushman Bharat through affordable technology, skill development and best practices in healthcare; deepening bilateral security and defence cooperation through 2+2 Dialogue; commencement of negotiations on the Acquisition and Cross-Servicing Agreement (ACSA) to enhance bilateral security and defence cooperation; signing of Implementing Arrangement for deeper cooperation between the Indian Navy and the Japan Maritime Self-Defense Force (JMSDF); commencement of cooperative research in Unmanned Ground Vehicle (UGV) and Robotics; continue efforts with regard to US-2 amphibian aircraft; decision to launch Annual Space Dialogue and collaboration in Joint Lunar Polar Exploration Mission; reaffirmation of shared commitment to total elimination of nuclear weapon; cooperation for getting India NSG membership; condemnation of growing threat of terrorism and its universal reach – calling upon Pakistan to bring to justice perpetrators of terrorist attacks, including those of November 2008 in Mumbai and January 2016 in Pathankot; cooperation in seeking expeditious and meaningful reforms of UN and UNSC; collaboration for achieving Sustainable Development Goals (SDGs) and climate change; explore collaboration in hydrogen-based energy, early conclusion of Regional Comprehensive Economic Partnership (RCEP) Agreement for realizing full benefits of a free and open Indo-Pacific region. Since 2016, Japan has committed approximately $8 billion to develop key ports and related infrastructure around the Indian Ocean. Projects under consideration include a joint project with India and Sri Lanka to expand an existing Trincomalee Port, a joint project with Myanmar and Thailand (which may also include India) to build a new port and special economic zone (SEZ) around Dawei in Myanmar, and a project with Bangladesh to develop the Matarbari Port. Japan has singled out the Pacific Islands for its next infrastructure push amid increasing concern that Chinese investment will consolidate Beijing as dominant force in the region. Tokyo is also eager to cooperate with Australia on infrastructure or maritime security projects on the Pacific islands. The Indo-Japanese Special Strategic and Global Partnership is amongst the most important in Indo-Pacic, if not the most important. This is doubly important in face of blatant Chinese hostility and aggressiveness. India and Japan have collaborated on various defence projects around the Indian Ocean, besides partnering in the Asia-Africa Growth Corridor. If there are any what may be termed 'slippages', it is only India to blame. Without going into all issues, two are significant. India failed to conclude the Shinmaywa US-2 amphibious aircraft deal ongoing since 2015 because of our belief that economic engagement and soft power are enough to ward off threats to national security. 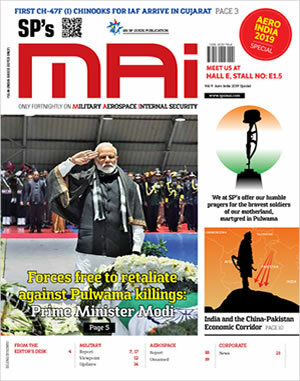 Hence defence allocations are pegged at levels of 1962 despite PLA's demonstrative aggressiveness all along the Line of Actual Control (LAC) despite the Modi-Xi Wuhan summit of April 2018; and instead of contesting PLA intrusions, attention is diverted by employing the Army on tasks like providing logistics support and constructing toilets for the hang-gliding competition in Himachal Pradesh, an event that has been held and managed without Army in the past decades. For the much publicised Ahmedabad-Mumbai bullet train, pet project of PM Modi, as of date the National High Speed Rail Corporation (NHSRCL) has been able to acquire only 0.9 hectares of the 1400 hectares land required for the project. On balance, for the India-Japan Special Strategic and Global Partnership sky is the limit. The Japanese are willing; it is for India to decipher how to optimize upon it.